The Sovereigns is located on the south-western side of Woking town centre – near the Victoria Way railway bridge. It’s quite large inside with many different seating areas. There is a small ‘garden’ area outside too. 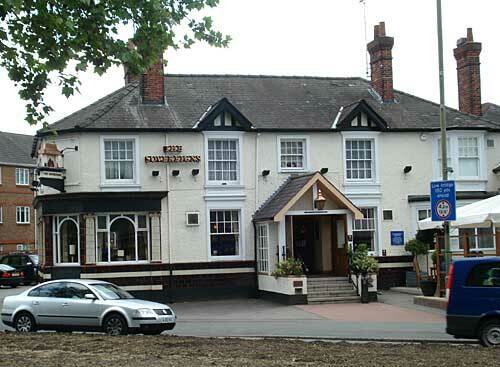 The atmosphere feels really friendly and relaxed, and there is now an area of the pub where children are allowed. There is a regular pub quiz on Monday and Wednesday nights too. Food is available until 9pm daily, and the couple of meals I’ve eaten at the Sovereigns have been tasty. Other review sites have commented that it can take a while to get served here but that has not been my experience. The beer selection is interesting and there are 8 handpumps on the bar so there should be something that takes your fancy. If you want to try a selection then the Sovereigns also offers ‘tasting racks’ for a very reasonable price. You get three third pint glasses of three different beers in a wooden rack. Real cider is sometimes available during the summer months. 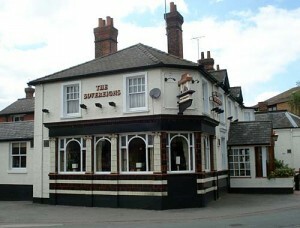 The Sovereigns has been in the Good Beer Guide in recent years, but not during 2012. However the quality of the beer has taken an upswing recently. 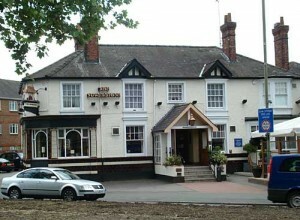 i went into this pub today after hearing about a quiz thats better then all the other in the area. i was realy looking forward to it along with a friendy staff service. but what i found was no quiz being held and staff members who clearly could not handle the amount of people. after waiting over 15 minutes to get served i over heared one member of staff saying ‘’why is it every thing in this place is f**ked up’’ and telling another customer or off duty member of staff (not sure which) why dont you shut your mouth for once. I must say i was not impressed at all. Always attend this pub for sky sports, great beer and sometimes do the quiz!! I must say it is always excellently run and the staff are excellent, however they occasionally get the freakish busy night, but staff capable of stepping up a gear!! Best in Woking easily! I always wanted to go there and today I had an opportunity to go with my friends and their kids for a nice lunch. We waited almost 1 hr to get served and the kids were hungry they started to cry and no staff or manager came up to us and said anything instead they said the kids are being noisy. The food was ok but the customer service is really bad. I wouldn’t recommend anyone to go there. Went for Sunday lunch with a friend. Very disappointed with service and our main course. We both ordered roast pork. When it finally arrived it was not the slices of roast pork we expected but a lump of pork which neither of us could eat. I do not like mushy vegetables but I do expect them to be cooked. On top of that it was cold.